Exams have always been a big affair for every student. To study for it, to score higher marks than others, to get a rank, etc. form a significant part of a student’s life. A while ago, exams were the only source of evaluation in our education system and they were conducted under the mainstream method. The students were asked to sit for a fixed number of hours to give the exam where the question paper was provided to the student, and he had to write answers to the questions given without any external help. However, this is increasingly being transformed in today’s time. CBSE (Central Board of Secondary Examinations) is one of the education boards that are going to lengths to improve students’ learning experience. In 2012, CBSE introduced CCE (Comprehensive and continuous evaluation) to understand a student learning difficulties at regular intervals of time which can help the student to strengthen his weaknesses. Open To advance this experience further; CBSE has recently introduced OTBA (open text based assessment) which will be a part of the students’ final assessment. In these examinations, students will be allowed to use their study material during the exam to frame and write answers to the questions given. Material for the papers will be provided to students, months before the examinations. OTBA is only supposed to function in class 9 and 11. To improve the quality of education, the concept of open book assessments is a revolutionary step taken by the CBSE board. This concept is helping to do away with the concept of mugging for exams and is focusing more on developing the analytical skills of the students. However, studying for Open Book Tests is not as easy as it seems. These tests are constructed so as to test your clarity of concepts and how these concepts are applicable in different situations. Thus, studying for these tests can be tricky. So students can take some extra care while preparing for this exam. 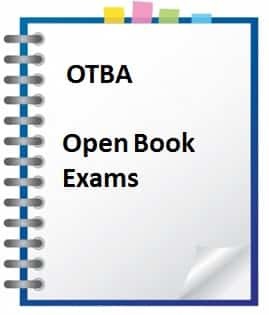 One of the most important aspects of open book exams is the study material that is available for the students to study from and carry for the exam. A student should collect all the study material there is so that he is not losing out on any topic or a sub-set of a topic that is a part of the syllabus. Also, being in possession of the study material ensures that the student has all that he has to study from and does not have to waste time looking for notes or texts. The only part where Regular Exams differs from Open Book Exams that during regular exams, students are not allowed to use their study material. Thus, students should make no exception to these examinations and study for them as they would for any other exam. They should memorise all the topics in the syllabus so that they are not missing out on any. The questions posed in front of the student in these exams asks them to analyse, compare, explain, etc. which requires them to frame answers from their understanding of the concepts and the material provided to them rather than just copying sentences from the texts provided. Thus students should focus on the ideas so that they are better able to structure their answers according to the question asked than what they have read in the study material. They should thoroughly examine all the texts given to them and focus on understanding the hidden concepts. This will not only help the student during the exam but also broaden his knowledge and give him the much-needed clarity. Questions in these tests are based on high order thinking skills (HOTS). These questions will rarely be direct, and there is a very little possibility that the answer to one question will be found in one particular chapter or paragraph. Thus, a student should make sure that he has learned every chapter or has gone through all the study material properly and understood each and every aspect of it to avoid confusion during the exam and save time. Students can also make notes from the study material if it is allowed, which will not only help them to learn better but it can also help them during the exam when they would just have to skim through a few pages of their notes instead of the whole study material. Don't expect to find quick answers during the test. Open book exams are also time-bound, so students have to manage their time to write the answers and also search for them simultaneously. This is a tedious process. Thus it is critical for the student to know where which topic is present and where to look to frame different answers. For this to be done, it is necessary for the student to be well versed with the study material. Within the topics also, he should highlight the important points so that he doesn’t have to search for these points during the exam and can find them in the first look. He should put sticky notes and flags that will help him in identifying the data during the exam. A student should not forget to carry his study material to the examination hall. If he has prepared notes, he should carry them with himself so that it’s easier to search for an answer within those notes rather than the bulky study material. This will save his time and help him write better answers. To give an open book exam within a limited time frame can be quite a task. One has to be properly organised and prepared for the test that he has to appear for. The best to prepare for the test is to practise through mock tests. This will help him to familiarise himself with the pattern of the paper and what type of questions to expect during the exam. This way, he won’t be taken by surprise. Practising before the exam will also help to know how to frame his answers. This is not only open up the possibility of the types of questions that can come but also expose the student to the kind of answers that he can give for different questions. Open book exams are exams with a twist. So every student should be properly acquainted with its pattern and about what & how to prepare for the exam to get better grades and avoid any confusion during the paper.